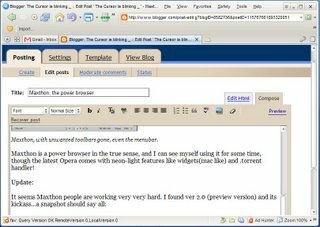 Its been quite some time since i wrote a technical post. So the one that fits the bill is Opera. It has everything, by default that I need from a browser, like auto form-fill, RSS feed reader, interface customization. But it falls short of rendering all sites correctly, such as orkut.com, or sites with unicode text, like the regional newspaper site esakal.com. So I tried playing with a different category of browsers...those based on IE. These applications build a lot of functionality expected from a modern browser and use the IE engine for rendering. Most sites are designed to work on IE. So you get perfect rendering, plus loads of featuers no there in IE. I tried using Avant browser for some time. Its good, its fast, very customizable. But I found it a little buggy (tabs switching use to cease when a tab is loading a heavy site) and cluttered. 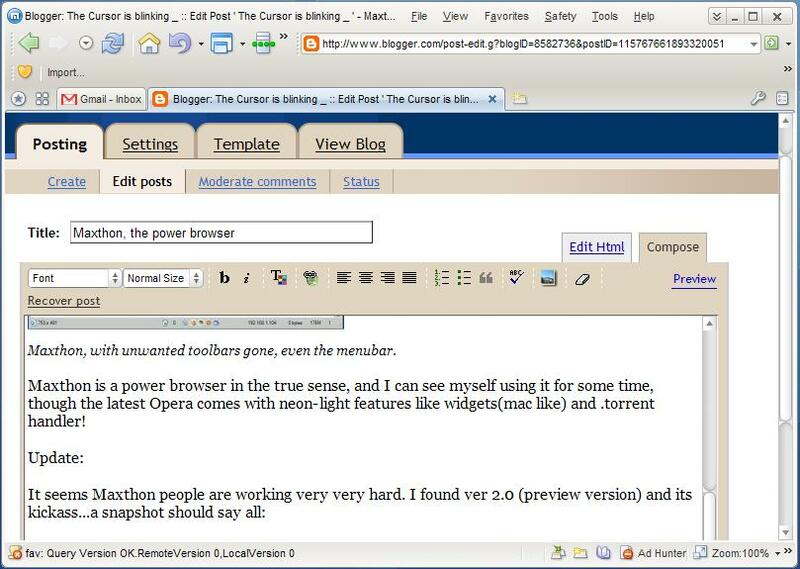 But till now it was my rank 2 browser, 1 being the indespensable Opera. 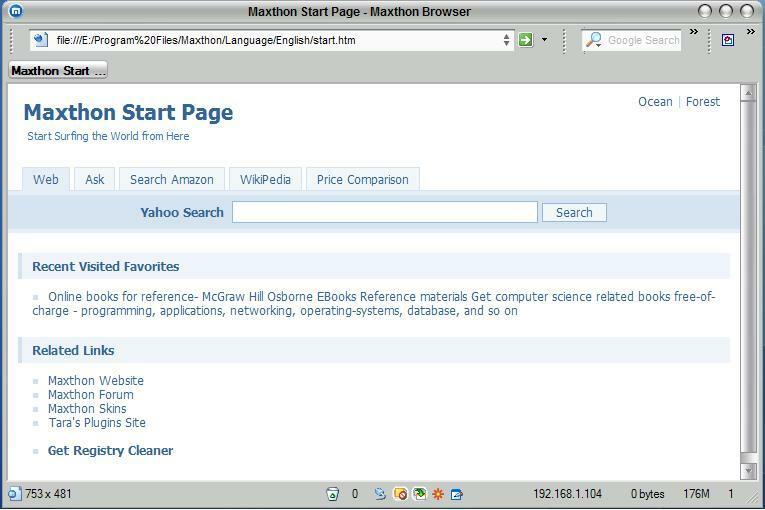 2-3 days back I tried Maxthon. And it has been my browser of choice ever since. Its a IE based browser, supports tabs, RSS feeds etc. Since it uses IE engine the rendering of all sites is flawless. It feels light, the interface can be customized to an insane extent. Like Ctrl+F11 toggles the menu bar! It has these great shortcuts, that you can almost surf without the mouse, and you save a lot of time. It comes with a weather sidebar thats really nice, and you get the Roboform form-filler bundled. The super-drag-drop feature is its USP.The other coolest thing is that it can change the rendering engine itself, it use the Mozilla foundation's Gecko too! You have to use it to believe what it can do. Maxthon, with unwanted toolbars gone, even the menubar. 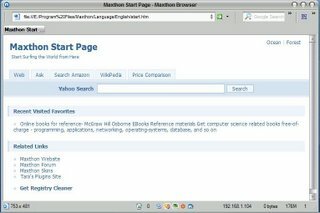 Maxthon is a power browser in the true sense, and I can see myself using it for some time, though the latest Opera comes with neon-light features like widgets(mac like) and .torrent handler! I'm using ver 2.0.0.8042 right now, results will vary with earlier ones.